Fine art, Illustration, graphic design and the art philanthropy of Sam Morrison: IF Submission - "Phoenix"
My Illustration Friday submission for "Phoenix". Nice illo. Looks like he's getting out of Phoenix. My Grandparents used to live in Vicksburg. He was pastor of a local church. this made me laugh after seeing all the birdies! i like this. 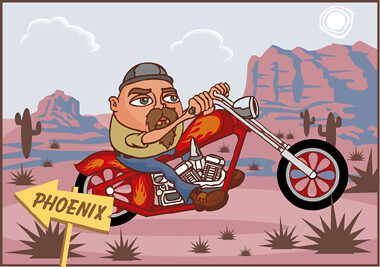 ive always wanted to ride through the desert. but maybe more in a johnny depp in fear and loathing in las vegas way, with the bats and the sidekick and a car with no top, not really with a hairy guy on a bike. but, i digress, you know, nice illo. Really cool idea and lots of personality on this biker. Your background is teriffic! I like the color. It reminds me of Phoenix! We also saw a lot of guys out there like this. I'm pretty sure this is my brother!